Murals of Iron Man, Wolverine and Spider-Man painted on the wall adjacent to the first floor of The Worklab look like grim sentinels. Below the paintings, a quote reads, “Even superheroes need a team to succeed.” On the left, a break-out area is furnished with a distressed tabletop and a bench. A tripod lamp with an antique finish is placed behind the tabletop, but the light that falls on the space is from tungsten light bulbs hanging from a salvaged wood panel.Terrariums in all shapes and sizes, tied to a string, dangle precariously in one corner, adding to the charm of the warm, rustic interiors. The Worklab, located centrally in Model Colony, along with other similar ventures in the city, is reinventing the existing model of a co-working space. It was co-founded a year ago by Ankit Sanghvi, a finance professional in his early 30s. The family-owned property was gathering dust until Sanghvi decided to refurbish it. Since its launch, The Worklab has opened its doors to freelancers, startups and even full-fledged IT companies like Alteatec. “I am renovating Hotel Pichola, which belongs to my grandfather, into a 240-seater co-working space,” says Sanghvi. The workplace that will come up in about two months, located in the upscale neighbourhood of Aundh, will have a dedicated recreational zone, equipped with an indoor rock-climbing wall and a gym. The Cowork Studio in Viman Nagar also exudes the warm, cosy, vibe of The Worklab. Manoj Singh Bora, 32, cofounder of Cowork Studio, started the set-up a year ago and has since opened another branch in Erandwane. “The new office was started in March this year,” says Bora. An IT professional, Bora decided to start Cowork Studio after visiting co-working spaces in the city. “I was not satisfied with them as they were expensive and charged hidden costs,” he adds. The Cowork Studio is minimal and roomy, with ample breathing room between workstations. Almost as quiet as a library, the only sound you hear is the clicking of laptop keyboards. Three members of a startup were huddled in a corner, discussing business ideas, while others were gathered near a whiteboard. Apart from the quiet environment, Prafulla Kamble, 26, was impressed by the natural lighting in Cowork Studio. It was just the sort of space Kamble needed, who along with two partners, is designing a neural network powered by Artificial Intelligence (AI). “Cowork Studio’s ambience and location is what attracted me,” says Kamble, a Purdue University graduate. Students who are on the verge of starting their own company, freelancers and startups usually frequent Cowork Studio. These co-working spaces follow design principles that aim to appeal to urban professionals who like a splash of pop colours and a touch of whimsy even within the confines of their homes. Ketaki Poonawala, an interior designer and architect designed the interiors of The Worklab. “I used old traditional switchboards to give the place a raw, urban look. You will also find planters in most of the rooms,” says Poonawala. The aim is to balance the professional setting of The Worklab with a homely atmosphere. Every other space that we have seen so far appears diminutive in comparison to Awfis, a 35,000-sq ft co-working centre at Teerth Technospace in Baner, which was inaugurated about three months ago. Awfis Space Solutions has branches in all major cities of the country. Amit Ramani, founder and CEO of Awfis had remarked in an earlier statement: “We were overwhelmed by the demand and need for experience-led workspaces in the Pune market and decided to commence our operations here. The centre in Baner is already 45 per cent occupied.” Awfis Space Solutions roped in Nelson India for workspace design and also has a robust inhouse design team working alongside Nelson for design and execution. “We have a well-defined collaboration area with interesting furniture, installations, flexible settings for networking events, enclosed spaces with good acoustics, and flexible meeting areas that can be easily reconfigured,” says Ramani. The Awfis in Baner is the company’s first community workplace. Their foyer is designed like a cafe, with high chairs for seating, and coffee and snacks being served on demand. Cabins devoid of clutter are divided linearly on the ground and first floors. The cabins are furnished with functional office furniture, but recreational areas are fitted with chic, contemporary chairs and couches. Fancy hanging lights illuminate the spacious cafeteria on the first floor. The company is targeting small and medium-sized enterprises (SMEs), manufacturing industries and BFSI companies. Awfis also runs a much bigger centre in Viman Nagar, which was launched two months ago. The Entrepreneur Facilitation Center & Development (EFC), which has been operating in the co-working space since 2012, opened a 64,000-sq ft facility in Hinjawadi earlier this year. The centre is spread out across three floors and boasts a posh lobby. EFC is designed to meet the requirements of all types of enterprises. “Eighty per cent of our occupants are IT-ITeS companies. The rest are into consulting,” says Akash Rai, a board member of EFC. Potential customers have the option to choose from serviced suites, which function as off-the-rack office spaces, serviced by a support staff. They also have studio offices for smaller startups. A cafeteria serves breakfast, lunch and dinner. “EFC has all the amenities and an ecosystem conducive for a young startup,” says Andrews Simon, the 44-year-old founder and director of ByteLogic, an HR solutions company, which has been working out of a cabin at EFC since last four months. Renting a desk costs as little as Rs 500 per day at The Worklab. Leasing a fixed seat for a month will set you back by Rs 7,500, but the perks include access to conference rooms, wired broadband internet, free coffee, communal areas and other services. Monthly charges for renting a cabin, having three seats, amount to Rs 16,000. A fixed desk at Awfis in Baner costs Rs 750 per day, Rs 3,500 per week and Rs 11,000 per month, plus taxes. Amenities comprise free Wi-Fi, tea and coffee on the house and printing and scanning services. Similarly, EFC charges Rs 7,500 per month for a seat and a cabin is leased for Rs 18,000 per month. There are no hidden charges. But Cowork Studio offers the most competitive rates — a desk costs Rs 80 per hour, Rs 450 a day and Rs 1,750 on a weekly basis and Rs 6,000 on a monthly basis. Again, there are no hidden costs. For all these services, startups and SMEs are flocking to these co-working spaces. Gaurav Kukrety, CEO of Alteatec, rented a floor at The Worklab earlier this year. “I wanted to focus on the company instead of the peripherals,” says Kukrety, who does not have to worry about the maintenance of his workplace. “The Worklab is centrally located, so I don’t see why I should opt for any other location,” adds Kukrety. Co-working spaces are also becoming popular because of soaring property rates. Added to that, one can connect easily with other startups in such workplaces. “You become more familiar with the technology that startups are currently working on,” says Suchit Bramhecha, 39, who manages DistroScale, an online video content distribution platform. Besides, these workplaces are not like any other shared office. In co-working spaces, importance is given to building a community of like-minded individuals. So you have app-developers, writers, graphic designers and independent professionals typically sharing the space with startup founders. This not only encourages an open exchange of ideas, but more opportunities arise for freelancers. “Most of my clients are from The Worklab,” says Sujit R Kirdkude, a brand designer. And, value-added services are part of the package. EFC has in-house chartered accountants on roll to assist its occupants and The Worklab too is amping up their amenities. “We will soon provide a diagnostic centre and personal finance services under one roof,” says Sanghvi. The co-working space model is based on the principle of economy of space, says Sanghvi. Space providers charge according to the number of desks and hours used. However, a co-founder of one of the most premium co-working offices in the city, who wished to remain anonymous due to an ongoing business deal, is averse to the idea of running a space that seats more than 300 people. 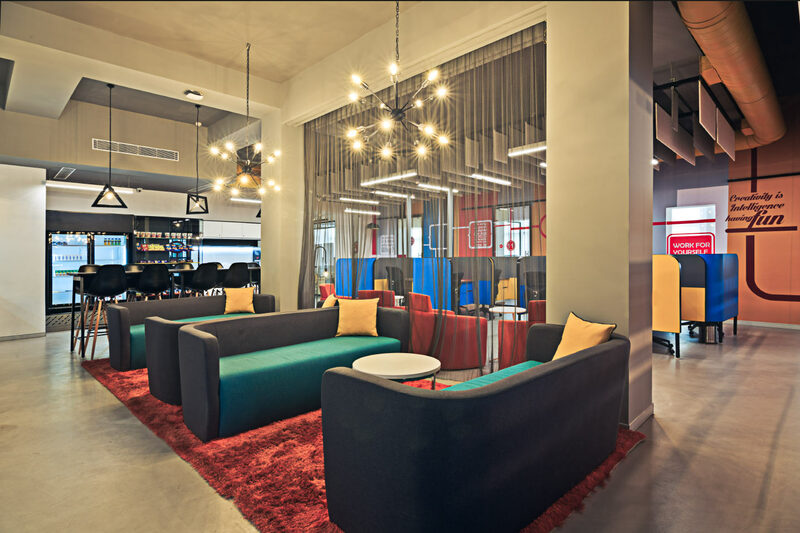 The entrepreneur took inspiration from his travels to Europe to design his workplace in Koregaon Park. High ceilings, minimalist wood furniture and elements of industrial architecture elevate the co-working experience here. Bigger spaces, though, “look no different than a regular IT company,” says the entrepreneur.